I have added two new notations. "S" for Ship and "X" for Razed settlements. The big excitement was the capture of the Ogre capital by the Lizardmen at the tail end of Turn 4. After that the Ogres had two turns, including extra moves due to "forced marches" to move one hex into the capital and try to take it back. After four attempts, they made it, taking heavy casualties during a river crossing gone wrong and then proceeded to smash themselves to a pulp on the walls of their former city. This has led to a considerable change in balance on the map, as the Lizards and Chaos forces are now divvying up the former Ogre lands (and the surrounding unexplored territory) in a strangely cooperative manner. The Skaven made a half hearted attempt at some inroads through Goblin territory and threatened an attack on the capital itself, but in typical cowardly fashion, didn't go for the final attack -- which would likely have suicide anyway. The Goblins hung near their capital, due to a combination of the Skaven attack, lack of a clear road through the mountains to their northwest, and starvation. The Orcs (disguised as yellow Bretonnians on the map) stood back and watched the destruction of the Ogres from a distance at the north end of their Empire, while exploration to the south led to the discovery of yet more barren coast land. Autumn spells led to additional income for the Lizards (on top of their already bountiful coffers,) the forces of chaos creating difficulties for the Orcs winter retreat, and the Skaven army being inundated with heroes looking to make a name for themselves. Winter events were a little more harsh. Famine, plague and banditry were widespread and affected all. What the map doesn't show are the numbers. 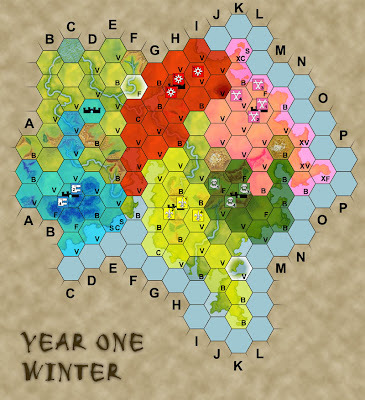 While the Lizards did deal a death blow to the Ogres, and have the largest chunk of real estate open to them, they blew their winter retreat back home through the mountains, and lost a second banner to a bad event. On the plus side, they've got far more cash to spend than any other Empire. They've also got a lot of distance between their capital and the other Empires. Both greenskin armies are hurting. The Orcs started with smaller forces than anyone else, and a lot of their territory turned out barren. An early battle with an independent settlement was costly in terms of casualties. The Goblins lost one of their smaller banners, but then also had crappy territory and ended up succumbing to starvation. They're not as bad off as the Orcs, numerically, and they've got a strong front against the Skaven (mountains and Fortresses) but they're cramped for land and half of what they've got is Barren. We've been adjusting a few things as we go. For example, in the various phases of Winter we discovered a lot of results for spells, events, etc. that would result in the utter destruction of entire banners of troops. If we had played it this way, there would probably be half as many troops on in the game. So instead, we roll on the winter retreat table, which is still harsh, but at least leaves something remaining. The Equinox spells and Winter events have a huge impact on the game. Looking forward to the espionage phase, there's even more potential for big changes. The actual battles have been minimal. We've only had a few. There were a lot of agreements and alliances this first year, however. I suspect this next turn will result in more. As far as the initial set up and army generation, the game was written for a slightly different army structure, so we've used some home brewed rules we found on a web page (I'll look for the link later) that adapted the game for 6th edition. Those mostly seem to have worked. We've also used a modified version of the 5th edition Siege rules. We're working on tweaking those a bit. We don't currently have any "advancement" or "experience" system where troops become veterans or characters improve. I think at least a basic system along these lines would add quite a bit of interest next time. Overall, though, the existing game seems to form a decent framework for a campaign so far. The "luck" factor does seem a bit heavy. So if the dice don't like you, there's a potential for harsh consequences.